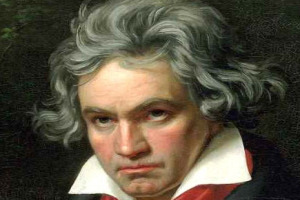 A piece of music composed by Beethoven in 1799 and lost for over 200 years has been painstakingly reconstructed by a Professor of Music at The University of Manchester. Professor Barry Cooper’s reconstruction of the original slow movement of Beethoven’s String Quartet in G, Opus 18 Number 2, will be heard in something like its original form this week, in a performance by the University’s resident string quartet Quatuor Danel. The movement was composed in 1799 but was discarded a year later and lost when it was replaced by a new movement now known to music lovers across the world. It is almost certainly the first time, says Professor Cooper, that the piece will have been performed since Beethoven’s day. Although the original movement is lost, detailed sketches survive for every one of its 74 bars, as was established in 1977 by Sieghard Brandenburg. It is only since then, however, that it has become clear that Beethoven actually finished the movement and wrote it out at the time. Professor Cooper has now managed to put the 74 bars together so that they fit perfectly, adding harmony and other details that enable the work to be performed again. He said: “This movement is of particular importance as it stands out as the last substantial work that Beethoven composed in full and apparently had performed in 1799 before it was discarded and lost. “With other works that he revised, like his opera Fidelio, discarded movements still survive more or less intact. A 28-year-old Beethoven had delivered the manuscript copies of three new quartets - Op 18 Nos 1-3 - to Prince Lobkowitz for 200 florins in October 1799. But the following year, he revised Nos 1 and 2, writing a completely new slow movement for No 2, in which little of the original material was retained and the rhythm was completely different. “Prince Lobkowitz had possession of early versions of Nos 1 and 2 for about a year or more, during which time Beethoven seems to have made no effort to publish them – a usual practice,” said Professor Cooper, based in the University’s School of Arts, Histories and Cultures. “Since the first three quartets were published in June 1801, and Nos 4-6 on 28 October 1801, just over a year after this second group was presented to Lobkowitz, this contract was probably for a twelve-month period. The performance will take place at a seminar open to the public at 2.30 pm on Thursday 29 September, in the Martin Harris Centre at the University of Manchester.